This interesting surname is dual nationality, English and Irish. In England it is recorded in the spellings of Hougham, Houghton, Haughton, Hottam, and Howton, and is a locational surname from any of the various places called Houghton, Haughton, and Hougham. These village names translate from the Olde English pre 7th Century "hoh" meaning ridge or spur of land, with "tun", a fenced enclosure or settlement, hence "settlement on the spur of a hill". A small group of Houghtons in Lancashire and West Yorkshire have as their first element the Olde English "halh" meaning nook, recess. Early examples of the surname recordings include such as: John de Haleghton in Yorkshire in the Hundred rolls of the year 1273, and Alexander de Houhton of Cambridgeshire, also in 1273. Robert de Hotham was recorded in Yorkshire in 1295 and Johannes Hothum also in Yorkshire in the Poll Tax rolls of 1379. Christopher Houghton, aged 19 yrs., who embarked from London on the ship "Thomas and John" bound for Virginia in July 1635, was one of the earliest settlers in America. In Ireland the surname can be found with the English spellings as above and also with other spellings which may be Irish or English. 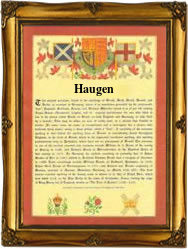 These include Haugh, Hough, Haughton, Haugean, Haugen, Haugin and Haugon. The origination with these names may be from the pre 10th century Gaelic 'O hEachtain, meaning 'the descendant of the son of the pleasant one' or similar. Over the centuries surnames in every country have continued to "develop", often leading to astonishing variants of the original spelling.